The Amazing Rebuild Published as 'All by Touch' in MGOC 'Enjoying MGOC' November and December 2011. 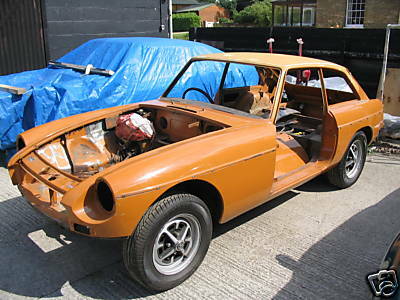 This is the story of a rebuild of an MGB. "What's so amazing about that?" you may ask and it's true lots of people do one, but this one is pretty special. The car was bought as an abandoned restoration in the form of a stripped, rolling, painted shell, with the engine and everything else in a pile of boxes. So the first thing is you don't know whether everything is there. Secondly the purchaser had never done one before, so he didn't even know what was supposed to be there, or where most of it went! But the most amazing part of this story is ... Terry is almost completely blind. Only finally losing his sight as an adult, he can now just about distinguish light from dark in one eye and that is all. Before that he was employed as an engineering machinist so has a good grasp of engineering principles, and has superb spatial awareness and imagination given a half-decent description of something. He has a full-time managerial job with Social Services, does DIY at home (things like installing a shower and laying laminate flooring in a conservatory), cooks for his partner, and takes a full part in looking after his two young children (although he says feeding yoghurt to his 2-year-old daughter gets a bit messy!). So Terry is certainly one to take on a challenge - and what a challenge. He was going to have to do everything by touch and imagination from others descriptions, going through all the parts, working out what they were and where they went, and especially locating all the fasteners - nuts, bolts and washers etc. I first came across Terry on an MGB email forum late in 2008 where he introduced himself saying what he was hoping to do and would probably need quite a bit of help. I was one of a number of people who replied saying we were more than willing to help where we could, and it was heartening that only one person made any reference at all to his sight problems, unfortunately and insensitively of the "Does he take sugar?" variety by asking if we had all missed the fact he was blind - to which no one responded. I was then honoured to be approached directly by Terry, who had already come across my web site, asking if I minded him contacting me directly from time, and of course I said I was more than happy. However Terry is in Essex and I'm about 150 miles away in the West Midlands so any contacts are going to be by phone or computer. November 2008: Terry fitted the tailgate (minus glass), rear lights, carpets and drivers seat. Then fitted the front and rear screens, without the filler strip or bright trim at the moment. December 2008: The gearbox and rest of the transmission system was in place and the first thing Terry needed my help with was getting the engine back in, which entailed finding and identifying the engine mount parts, which I described as best I could. Terry is very experienced in the use of computers, special products for the visually impaired like those that translate text to voice being particularly useful, which is how Terry was able to access my web site and the email group. Perhaps surprisingly he also uses video, and over the months emailed me quite a few showing parts or situations he was enquiring about, and I either emailed my replies or we would 'chat' on Messenger. Sometimes we would use 'live' video over Messenger - him showing me something and me responding, and interestingly he prefers me to type my responses rather than speak them as that way he can 'play them back' several times until he has fully grasped it or has a further question, rather than keep asking me. The first video Terry sent me was of what he thought were the engine mounts, but which actually turned out to be the door latch striker plates, and that set the tone for many amusing moments over the coming months. He hired an engine hoist and whilst he had the chap that brought it round help him erect it he then sent him away as he wanted to do this rebuild himself, and in the past he has found that sighted people tend to 'take over' which puts visually impaired people in the awkward position of either offending their helper or keeping quiet but frustrated. And this is where the first headache arose. Despite the gearbox being jacked up to the top of the tunnel, and with the gearbox shaft in the hole in the clutch cover plate, Terry just couldn't get the front of the engine down low enough to get the two aligned and the friction plate splines to slide onto the shaft. After a day of struggling, and getting the rental bloke to have a go as well before he took the hoist back, he gave up briefly while we took stock. I'd recently changed the clutch on a pal's rubber bumper and had no problems whatever in getting the engine off or back on the gearbox shaft, but that may be because the rack is in a slightly different position on those cars to the chrome bumper Terry has. There then ensued quite a bit of discussion back and fore as to what might be wrong and how to resolve it. The gearbox crossmember is mounted to the chassis rails with two bolts each side, so I suggested bolting the front hole in the crossmember to the rear hole in the chassis rail to move the gearbox a couple of inches further back. Next time he borrowed the hoist it still wouldn't go in. In desperation I suggested slackening the cross-member bolts as much as he could without them actually falling out, to lower the back of the gearbox an inch or so and give a bit more angle on the gearbox shaft, and finally the two went together, but not without a hard shove born of desperation on Terry's part! First major hurdle cleared but it took until the beginning of January, and fervent hopes the rest of the rebuild wasn't going to be as difficult. The next job was getting the exhaust attached to the head, complicated by the fact that it is the after-market three-branch manifold and extractor down-pipe system which I wasn't expecting. But another video soon revealed that, and not too bad a job. Also inlet manifold. The starter motor was fun, being so heavy that it is not easy lying on your back, trying to hold it up with one hand while inserting a bolt with another. Eventually installed by tying a rope to it, looping that over something on top of the engine, then pulling on the rope from below to get the starter to the right height and tying it off, while the bolts were inserted. In January Terry tackled the clutch hydraulics but the first attempt at bleeding had fluid running everywhere. After a lot of fiddling about it was discovered that the piston was missing from the slave cylinder on the gearbox, presumably someone had been pumping the pedal after the engine was removed, which has pushed it out and it got lost. Didn't stop the perpetrator pushing the seal back into the cylinder and fitting the outer cover to hide what had happened! New slave ordered and fitted. This is a very shortened version of what actually took place over a period of five months! And even then when he got the engine running he had the inevitable problem of the clutch friction plate being stuck to the flywheel, freed by briefly turning the ignition key to 'start' while in 4th gear with the clutch pedal fully down and the brakes on - but that didn't happen until September! At one time we suspected a problem with the master seals, and so the pedal box had to be removed, of course some of the screws were seized and had to be drilled out. Bad enough but of course Terry can't see them, so has to feel for them, place the drill bit on them while his finger is there, then it is highly recommended to remove finger before starting drill. But of course every now and again things don't go quite according to plan, and Terry rips a chunk out of his finger - the sort of hazard he faces on a daily basis along with walking into things and barking his shins, misplacing tools and parts, and banging his head on open bonnets and hatches and so on. And this is where we should all bow down to Terry and raise a statue to him, for refitting the heater was next! Anyone who has had any contact with MGB fora will know what a pig this is, getting the air direction control cable inserted with that pesky rubber block, but Terry did it. Not without some fun along the way though - the air flap in the heater unit was a bit stiff so Terry thought he would ease it with some WD40. The only problem was - he picked up a can of spray adhesive instead! Like I said at the beginning, we had some laughs along the way. He managed to clean that off with white spirit, get some WD40 on it, and as I say get the heater installed, together with the connections to water valve and bottom hose. February: The rear side windows and all the trim around them and along the gutters went in relatively easily, as did the carbs (which caused a bit of head-scratching as they are the later HIFs) and cables, alternator, cooling fan and belt. The coil needed another video as it is a non-standard unit with more spades than normal. Terry can't see the + and - markings of course but it doesn't matter that much if the low-tension side is connected the wrong way round. Fitted the rear bumper, number plate lights, bolted down the oil cooler and radiator (they were removed as one with the engine complete with the radiator mounting panel). One side of the radiator seems to have parted company with its mounting bracket at the bottom, not ideal, but can be fitted for the time being. Attached carb hoses. One of the many pipes, wires and cables turns out to be for the washer, which is of the bag type, but doesn't have the proper mounting bracket so one has to be made. March: Terry is now at the point where he can connect the batteries and try and crank the engine. The batteries need charging, and Terry has a charger, which gives rise to the question of which wire and croc-clip is which when you can't see them. Thinking ahead when he first bought the charger he checked with his partner and tied a loop in one of the wires - very clever. However by the time he came to use it he had forgotten which colour wire had the loop! Also there are a couple of switches on the charger which have to be in the right position of course. I was looking at a web picture of the charger and describing which ones had to be pushed in what direction, but this didn't seem to be making sense with what Terry had, so yet another video. We then realised that I was looking at a picture of the charger 'right way up' for the writing under the switches, whereas it is all the same to Terry and he had it lying on its back on the ground and the other way round! More chuckles, and Terry sends me a very amusing description circulating in the sight-impaired community of some of the difficulties that sighted people have in communicating with the non-sighted. Of course you have to put the right charger cables (and cables in the car) on the right battery posts, some batteries have + and - raised symbols which Terry would be able to 'read' with his finger tips, or coloured rings on the posts, but Sod's Law dictates that his batteries have neither. However the posts are also different sizes and Terry's sense of touch is such that he can easily tell which is which. With the batteries charged and back in the car a deep breath as the key is turned ... and nothing, no clicking coming from the starter relay or solenoid. I suggest using one of the horns (which does work) as a crude voltage detector, which works up to a point to show there is voltage at the fusebox and coil. However Terry complains about the noise until I suggest a rag stuffed into the trumpet - more chuckles (subsequently he gets a talking multi-meter via a pal in Canada). Eventually I realise that the problem is probably that the earth wire for the starter relay hasn't been bolted to the body yet, Terry fits that and bingo - it turns over! However no noises from the fuel pump, and this was the start of a long series of problems which took until the end of May to resolve. Of course the points were oxidised, I talked Terry though removing the end-cap and cleaning them and that was a success in as much as at least it now clicked. Then he had got the pump inlet and outlet connected the wrong way round so the pump was pressurising the tank, but it sounded the same as if there were a vacuum so we thought there was a problem with the pickup in the tank. Then he found the pipe from the tank to the pump was leaking - corrosion having perforated it, then having replaced that the pump stopped again. At that point I suggested Terry post the pump up to me, where I found that having removed the end-cap the pivot pin for the points had slid partially out and they had come apart but Terry had been unable to see that before he refitted the end-cap, which was an easy fix, tested and posted back again. During this from time to time Terry was getting occasional popping noises from the back of the car, neither of us knew the cause, but with the possibility of it being electrical arcing at the same time as fuel leaks was cause for considerable concern, and lead to at least one rapid exit from the garage, and an anxious wait to see if it burst into flames! Other traumas were caused by cranking and getting loud reports from the back of the car, which turned out to be nothing more than incorrect plug lead order. Finally, in July after some eight months of very intermittent work given all his other commitments, the engine starts and runs!! The heater also works although one of the hoses came off spraying coolant everywhere as it was too short. Also the drivers door is attached complete with lock mechanisms, latch and striker plate, quarter-light and drop glass. All these were done without any reference to anyone else, and when I expressed my admiration I was told that they are all quite self-explanatory! In April we have a few days at our Son's place in Cambridgeshire so as that's more than half-way to Essex it's a good opportunity to meet Terry face to face for the first time and see how he is getting on. Terry has some 'colour coded' jobs lined up for me like connecting the harness to the rear lights and repairing the heater and headlight wires which the dismantler had just chopped through instead of parting the bullet connectors. Looking around I see the insulation on the wires to the coil is cracked where they exit the harness so peel that back a bit and strengthen with heat-shrink tubing. I also happen to spot that Terry has connected the fuel supply hose to the servo port on the inlet manifold ... 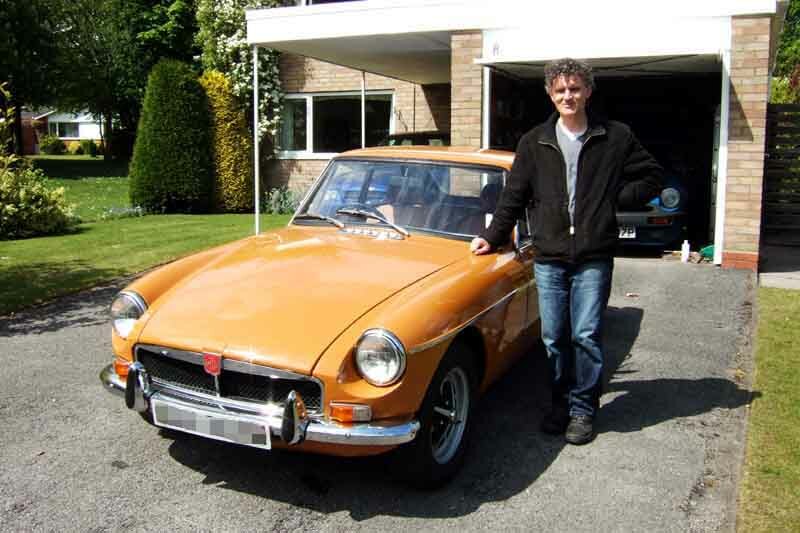 I gently point out that the MGB doesn't have fuel injection, and we have yet another chuckle about that. I also spot a new relay lying in a corner, bought in case it was the starter relay that was faulty, and Terry says "Oh, I was wondering where that went". One of the quarter-light studs had snapped off, presumably on removal by the PO, which meant it was loose in the door when Terry refitted it. These studs are permanently attached to the frame, but I have taken my welder down with some spare bolts and am able to weld one of those to the stub, which proves good enough to firmly mount it in due course. Terry also has a new tunnel carpet which needs the hole cutting for the gear lever, so I cut and fit that. I happened to spot the short additional tailgate seal in a box which Terry hadn't found, so I showed him where and how it fitted and he subsequently removes the tailgate unbolting it while it is resting on his back, manoeuvres it out through the garage side door, lays it on the grass to fit the seal, then reverses the process and refits the tailgate! No mean feat as it is now quite a bit heavier with the glass installed than it was when he first fitted it. As well as the chopped headlight wires the inner chrome ring that clamps round the glass-fronted reflector and positions it in the bowl had corroded through in places. It's an aftermarket Wipac unit, so rather than buy a complete headlight unit I locate a repair kit at a local Mini specialist and post that down together with the repaired pump. For some reason the servo has been dismantled (probably the dismantler didn't realise that you have to remove the servo by undoing the bolts that go through the bracket and the shelf it is mounted on and remove them as a unit, and not remove the servo from the bracket and then the bracket from the shelf), but Terry was able to reassemble and fit it. May sees the first attempts at bleeding the brake system, but like many other things it's not straightforward and takes several goes. The passenger door is a problem as not all the hinge screws will go into the door plates. First thought was that they had been sheared off or just the heads drilled off on removal, but a small screwdriver passed right through so it wasn't that. In the end a tap had to be purchased and when run through the holes the screws went in, but by then it was September. June sees Terry studying for a promotion (which he obtains) so not much work done on the car. However the filler strips in the front and rear screen rubbers were fitted - very painful on the thumbs as the special tool was not available - but the bright trim strips are a 'bridge too far' and will have to be fitted by a professional. In July the air filters and carb vent pipes were fitted, also the headlights but not the outer trim rings until after the MOT as they would certainly need adjustment. The bonnet (which all this time has been propped up in the bedroom!) has the soundproofing glued on while it could be laid upside down on the grass, then fitted. In August the front bumper and grille were fitted, and it's beginning to look like a proper car! September: Terry hadn't been happy with the adjustment of the quarter-lights as they seemed to be bending back as the door was finally closed, which risks 'the crack of doom' which is when the door skin splits, but when I explained about the slotted mounting point at the bottom front corner of the door he got this right. Then another chuckle as none of the ignition electrics seemed to be working, until I explained the switch needed to be turned two positions for ignition as the first was just for the accessories! Testing the electrics the indicators weren't working, which turned out to be the wire broken off the moving part, which Terry was able to resolder. One side flashes but not the other with just the ignition on, but both sides flash at an acceptable rate with the engine running, so should be OK. As I mentioned above Terry has some light perception in one eye so in the dark garage he is able to see if lights are on or not. One reversing light isn't but twiddling the bulb in its holder fixes that. One side light isn't working which needs a new bulb. Yet another chuckle was the middle exhaust mount apparently missing, so Terry purchases a new one, then when he gets underneath to fit it he immediately finds the one that is already there! The seat belts are a real oddity as they have the slotted end plate that normally attaches to the quick-release fastener on the tonneau panel of roadsters. On Terry's car this is just hooked over a bolt on top of the rear arch, so could come off and is unlikely to be acceptable on the MOT, so a new pair of inertia belts are purchased and fitted. October, and Terry discovers oil dripping from the dash after the engine has been running, which turns out to be from where the pipe attaches to the oil gauge. While tightening that the bezel and glass comes off, so at least Terry is able to feel where the needle is pointing with the engine running and declare the pressure satisfactory! The manual washer pump doesn't seem to be doing very much, but an MOT is booked. However the engine (car driven by a friend!) is cutting-out badly, dies altogether after just a few yards and has the ignominy of having to be pushed back home. It could be the condenser so Terry changes that, but it's still cutting-out. And here we really stretch technology as Terry uses his wireless connection to point his laptop camera at the tach while revving the engine, and over a video link via Messenger I can hear the misfiring while I watch the tach! The tach is steady so it isn't an LT problem other than possibly the condenser (which has already been changed but we know how new ones can be!) so is probably HT or fuel. We discuss whether it is feasible to connect a timing light and point that at the camera where I can watch it, but I doubt the technology is up to capturing all the flashes, and missing flashes (due to the link and not the engine) will lead me to think it is an HT problem, so we don't go down that route. However the fuel pump has been regularly clicking, more than one would expect, so Terry yet again goes over the pipes and hoses by the pump and finds one of the hoses kinked! Straightens that, pump clicks and stops as it should, and the cutting-out has gone! So another MOT (and driver) is booked, this time the car runs faultlessly, and passes with just an adjustment of a rear brake and a replacement washer pump - flippin' marvellous! Terry's driver said the look on the MOT chap's face when he was told the car had been rebuilt by a blind person was priceless! In November at last Terry can go for a ride in his car, but the gears are intermittently baulking and grinding when selecting reverse, so it sounds like clutch problems. Getting the engine out again is the last thing that Terry wants to contemplate, and quite by chance there is a very timely note in Enjoying MG that with new clutch hydraulics or when they have been dry for a time they may need to be pumped repeatedly for as long as you can manage before the pressure seal ... well, seals. Terry has two legs and uses them both to exhaustion, and after that selecting gears is fine - phew! There is no headlining with the car, and this was another major headache. The Parts Catalogue quotes part numbers for the main board in the roof, plus the deep rear section that carries the luggage area light, plus strips for the side and front rails. Having a look at mine these side and front rails are a puzzle as it seems to be just 'sticky-backed plastic' stuck onto the metal 'rails' that are part of the roof and what the main board is supported by. Googling the part numbers just shows a recovering kit which is only foam backing and covering. However one source has a second-hand the rear section, and another not only removes the main board from one of his cars, but also the side and front sections which are indeed little more than sticky vinyl. Terry installs the main and rear sections, planning to fit the front and sides later, although really these should have been fitted before any of the glass as the edges go under the rubbers. When I see the car again later on I realise these were never removed, but by this time Terry has attempted to stick the second-hand ones on top, which isn't very successful. Speaking of Enjoying MG Terry joined the MGOC a while back when he started buying parts, and although he receives the magazine each month of course it is inaccessible to him. A lot of the content is online, but presented in Flash format which Terry's computer 'screen reader' can't cope with. I contact Richard Monk at the MGOC who very kindly agrees to send Terry the PDF file that is used to create the Flash site, which Terry can 'read' using his standard software. By now (March 2010 or so) the car is basically 'finished' so when he can get a driver they take it out, but occasions and distances are unfortunately few, although his drivers - all new to MGBs - all seem to love the experience. By June it has only covered about 30 miles on local roads, but Terry is keen to bring it up to show me so we fix a date. As the date gets closer nerves set in, and Terry can't decide which is worse - admitting he chickened out and cancelling the trip or admit it had broken down and had to be towed home. So he bites the bullet and makes the trip, and travels up to see me and another pal in the area, about 340 miles here and back with no problems! Terry started this project with the intention of selling the car when finished, and still plans to, but in the meantime he was so impressed with the sound of my V8 when I visited him he has bought one himself, this time a rubber bumper like mine and in the same colour and only a couple of hundred cars distant, but at least this is a runner in all respects and a 'keeper'. Not only that he has bought himself another abandoned restoration, an early roadster that has had nearly all the welding done but is going to need a lot of work. It could be said that you don't have to be mad to want a 30 or 40 year old classic but it helps, and I think Terry has demonstrated that he is madder than most!